Description: The Blood Covenant by E.W. Kenyon depicts the significance of the Lord's Table which is understood fully by very few. This blood covenant truth, hidden away in the memorial of the Lord's Table, and forming the foundation of it, is of such a nature that your heart will thrill in response to the possibilities that present themselves, and will stir you to lay hold on the same power of the apostles through the Blood Covenant. The Bible is composed of two covenants, contracts or agreements. The first covenant was between Abraham and Jehovah, and was sealed by circumcision. This New Covenant, a blood covenant, is sealed with the blood of Jesus Christ, God's own Son. It is impossible to describe in words what the Blood Covenant will mean to you once you understand it. This book, The Blood Covenant, is a must for every knowledgeable Christian! E.W. 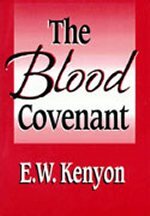 Kenyon the author of the Blood Covenant, went home to be with the Lord in 1948 and of all his writings the Blood Covenant stands as one of his premier works. The Blood Covenant is for me!